When your muscles and circulation are being taken care of for you, you can concentrate on your sport and technique - that's why these high performance Puma Performance Running Compression Knee High Socks have been designed, so you can perfect your form and protect your body during running sessions. 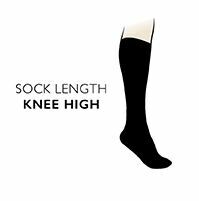 The entire leg offers comfortable but effective compression to improve stability and blood flow for faster recovery. Under Puma's Power Cell structure design system, everything is done to avoid blisters, with flat seaming, similar to the more traditional hand linked toes for smooth seams being used, and an anatomical left/right design to enhance the fit and help avoid friction. Thin zonal cushioning is strategically placed for maximum comfort and minimum bulk, and the use of Tactel microfibre gives super speedy wicking, keeping feet drier.